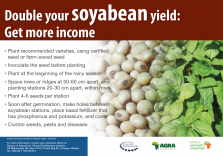 A3 poster highlighting how to grow soybean. Produced at a write-shop in Kenya facilitated by ASHC. Better soybean through good agricultural practices is a 16 page booklet giving information on growing soybean. It was produced at a write-shop in Ethiopia facilitated by ASHC.